People of more than eight different language groups including the Manyjilyjarra, Kartujarra, Putijarra, Warnman and Pikarli are known under the collective name of the Martu, a Manyjilyjarra word for ‘one’ or ‘man’. Their country includes the Percival Lakes, Lake Disappointment, and across the Canning Stock Route to the West Australian–Northern Territory border. A major painting theme is that of Wirnpa, the rain-making snake, his country and signiﬁcant site of the same name. This site is also central to the Yulparija from the same region but resident at Bidyadanga near Broome. Important creation stories that are also represented in contemporary paintings include those of Marlu (the Kangaroo), Kaarnka (the Crow), and Kirrki (the Banded Plover). In addition, the artists depict their own countries of Lake Disappointment, Jigalong and the Rabbit-Proof Fence and those of the Canning Stock Route and places along it such as Well 33, which writer Stuart Rintoul described as a ‘white man’s landmarks scratched on a vast and ancient canvas’. In October 2007, Martumili Artists held a sell-out inaugural exhibition of some 75 works at Melbourne’s William Mora Galleries. Purchasers included the National Gallery of Victoria which bought 12 works. Many of these artists, including Dulcie Gibbs, are involved in the National Museum of Australia’s Canning Stock Route Project. 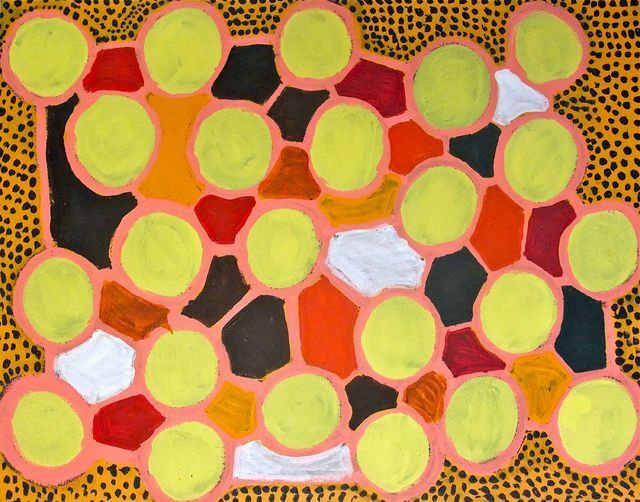 A huge multi-faceted project that is exploring the history and culture of indigenous people and the impact of white civilization on the region, one important aspect is `back to country’ painting trips in which traditional owners now living elsewhere return to their traditional lands and sites to reinforce their knowledge of these lands. Reinvigorated by renewed familiarity with land, art is now mushrooming in the region in works that are traditional in iconography but entirely new in vibrant and often experimental use of colour and abstraction.